Utility vehicles are becoming popular in many different applications, both as transportation and for hauling cargo. Usually, a utility vehicle is simply a golf car with a bed hitched to the back for hauling equipment and supplies. However, some manufacturers can design them from scratch to transport heavy-duty materials, drive over rough terrain, or carry additional passengers. Commercial and industrial businesses use utility vehicles to haul materials and commute from location to location. Some heavy-duty utility vehicles can carry extremely heavy loads, while still fitting into smaller spaces than a standard fork truck. For farm or ranch work, a trail utility vehicle can transport hay, seed, and fertilizer with ease. Consider your needs before purchasing a utility vehicle. Make sure it has the features you’re looking for, but doesn’t exceed what you can afford. Visit multiple dealerships to in person and ask to see their service and parts departments in action to get a feel for how they do business. If possible, work with factory-authorized utility vehicle dealers. Since they carry multiple brands, they have easy access to OEM parts and can provide quality factory training for their repair technicians. Commercial utility vehicle: Similar to standard golf carts, but with larger engines, higher suspensions, and knobbier tires for more demanding applications. Industrial utility vehicle: Designed for use in industrial applications – can include hauling equipment and supplies or people. Personnel carrier: Used foremen and managers to quickly get to far-away locations on job sites to make sure business is running properly. Burden carrier: Extra heavy-duty hauler, can carry up to several thousand pounds. 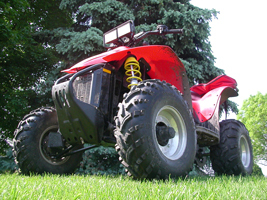 What will be the primary use of your utility vehicle? What is your drivetrain preference? Do you have a preferred seating capacity?